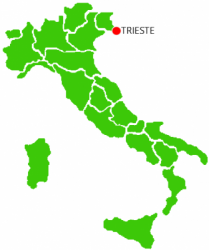 from the A4 highway: after the Lisert tool boot continue for 10 km, than take the “Sistiana – Trieste” exit. Proceed for 3 km to Aurisina. The agritourism sign will be visible on your right. From the state road 14 Monfalcone – Trieste: at Sistiana intersection take the SP 1 to Aurisina. by bus: bus n. 44 from piazza Oberdan, get off the first stop after the Aurisina square. The service runs every 40 minutes. by plane: Trieste airport – Ronchi dei Legionari is just 20 km away, take the bus number 51 Ronchi – Trieste, Sistiana stop (bus every 30 minutes). By car take the A4 highway, heading towards Trieste and then as above. There is also available a train to Sistiana.